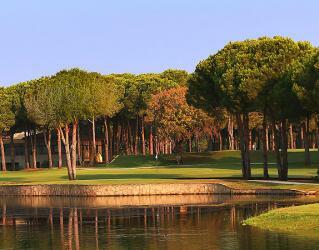 One of the first hotels in Belek, Gloria Golf Resort set the standards of combining golf with luxury hospitality. Being renovated to keep up with the trends ensures this hotel offers its guests a 5* stay in a modern and classy environment. 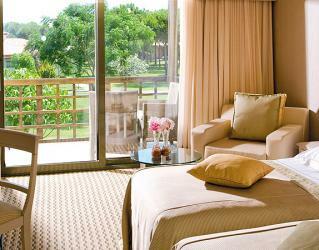 Here you will find the pleasures of luxury and the comfort of nature intertwined smoothly. The modern rooms enriched with colourful details on the walls, the delicious cuisines from all around the world, a wide array of entertainment options, inviting indoor and outdoor pools and the exclusive service all around the resort will ensure you will have a genuine golf holiday experience. Surrounded with lush greens, all rooms of the resort, ranging from standard rooms to suites and villas, offer a special experience in the nature where you can hear the birds singing and sense the fresh scent of pine trees. 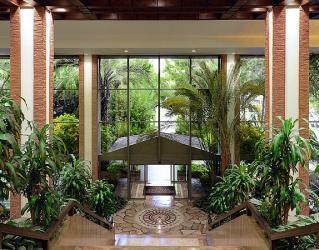 Some of the rooms are found in the main building whilst others have their separate areas within the hotel grounds. All the rooms are packed with LCD TV, telephone, minibar, internet connection, safety deposit box, tea and coffee setup, hairdryer, bathrobe and slippers and bathroom toiletries. 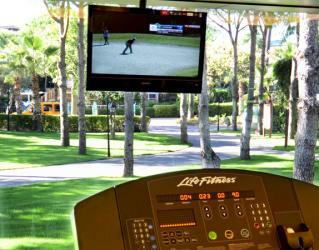 Experience direct access to the Gloria Golf Club; home to 3 prestigious golf courses. Take your pick between the New Golf Course, Old Golf Course or the Verde Golf Course. For a fantastic golf holiday, play all three! Breakfast, lunch and dinner are served in two main restaurants, the Anatolia and Mosaique Restaurants, both with their own unique and creative concepts. Each night a different cuisine of the world is offered in the Anatolia Restaurant. 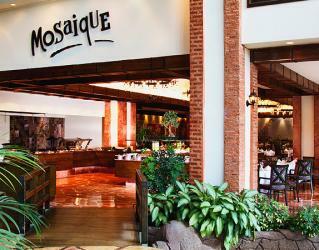 Mosaique Restaurant, located next to Anatolia Restaurant, offers artful and creative dishes. Take your pick between the A’la Carte restaurants that offers Spanish, Italian, Turkish and Far East cuisines. For dessert, Patisserie is filled with fresh baked cookies, cakes and macaroons. Wide arrays of alcoholic and non-alcoholic drinks are included in the all-inclusive concept of the resort. Lobby Bar, serving drinks and aperitifs, is open 24 hours. In Oasis Bar, where lush greens and smooth colours are combined for a relaxed ambience, a fine selection of drinks is served until midnight. 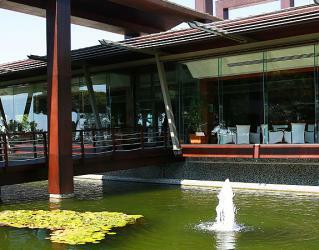 In the summer season, Garden Pool Bar, Sushi Bar, Gloria Pub and Pier Bar are available with refreshing drinks. 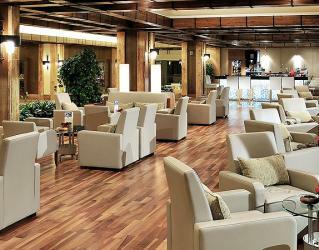 With its stylish bar, Café Gloria serves drinks accompanied with numerous activities like karaoke and movie nights. 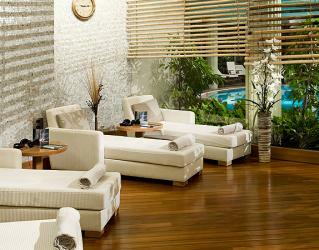 Let yourself unwind in the La Source Spa. The various massages, facials and body treatments await you here for an ultimate relaxation experience. The traditional Turkish Bath, saunas, steam bath and the indoor swimming pool are freely used by the guests who wish to soothe their body after a long day on the golf course. The Gloria Hotels & Resorts group offers a huge variety of entertainment for everyone throughout the year, the most impressive during the summer period. As well as 3 world class golf courses, they also offer an entertainment centre with a huge screen for sport fans and a disco spinning away with all the latest tracks and golden oldies. Insomnia Night Club is open late into the night if you fancy having a great time dancing the night away. The fun daytime activities include boccia, darts, tennis, water gym, mini football, zumba, Pilates and aerobics. The fitness centre of the Gloria Hotels & Resorts is the Fit Gloria; with fully equipped and functional equipment and professional trainers. Fit Gloria offers spinning and Bosu as group exercises. The Gloria Golf Club’s New Golf Course is an 18-hole, 72 Par golf course opened in 2005. The fairways are Bermuda grass and it has a total of 63 bunkers and 7 lakes. There are 4 tees and the pro tees are not so forgiving as the forward tees, even though it is one of Belek’s shorter courses with a total distance of 6,239 meters. 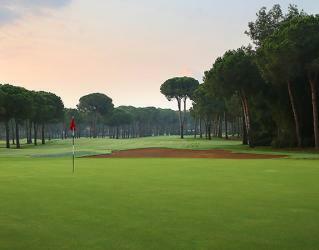 The Gloria Golf Club’s Old Course was one of the first in Belek, opened in 1997. This 18-hole, 72 Par golf course offers its players Bermuda grass fairways and dense forests surrounding them – you are unable to see other fairways on some holes. There are a total of 67 bunkers and 7 lakes with a total distance of 6,279 meters. The Gloria Verde Golf Course is a 9-hole, 35 Par course adjacent to the Gloria Old Course, which was opened due to the high demand of tee times. You may play this 9 hole twice or mix it with the Old course. There are a total of 28 bunkers and 2 lakes over a total distance of 2,812 meters. Select Course is a combination course of 9-hole Verde Course and 9-hole part of Old or New Course. In this way, the club offers more alternatives for players. 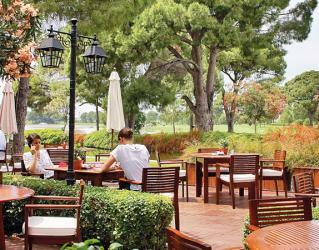 Just a note to let you know, we had an excellent holiday across in Belek at the Gloria Golf Hotel. The group we took with us had never golfed in Turkey before and they were all impressed. The hotel is still the same high standard with excellent staff. The Bilyana team across there, were also very professional, prompt and helpful. Many thanks also to you, for the very efficient organisation with the booking. We hope we will get some more quotes from Bilyana in the future. Best wishes to you and all the team. I would like to thank you for all the help you have given me with our groups recent golfing holiday to Belek. Whilst unfortunately I was unable to go, the other members of the party all said they had a great time especially with the accommodation at the Gloria Golf Resort being excellent. 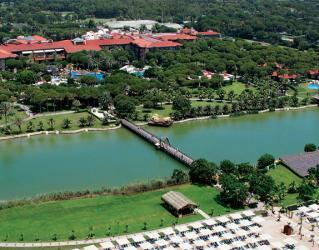 The whole holiday was very enjoyable helped of course with the excellent weather in Belek. The overall service and professionalism you provided was excellent. I would have no hesitation in recommending Bilyana to my golfing friends and hope that there will be further opportunities for me to book with yourselves on behalf of our group. Thank you for yet another wonderful golf holiday, every thing was well organised from arriving to going home. Our thanks to your effient and punctual drivers. Hope to be booking for next year in September. Home again. Many thanks to you. Our holiday was perfect thanks Bilyana and Belek. Everything works at time and drivers are polite. Hopefully you can help us next year also. Not sure if it was you that organized the tickets for the Turkish Open or not,but we received 4 lots for every day free of charge. This was a great service once again and I have passed your email address to different people we met on holiday. I'll be in touch later to organize for next year,once I've got some numbers of how many would like to go. Thank you for your information. Our holiday has been very nice. 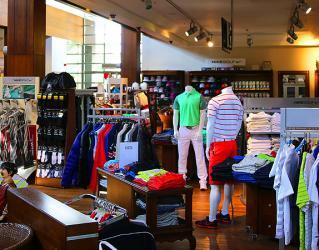 We like about Bilyana Golf services. Everything has been as promised and over. Drivers are very polite and helpfully. We are coming next year and our agency is always Bilyana Golf. We would like to thank you for the great organisation of our vacation. 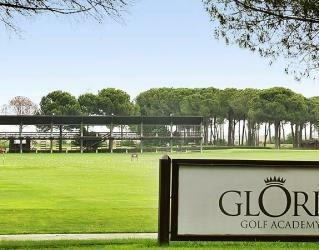 we really spent two wonderful weeks at Gloria Golf Resort in Belek. We liked the hotel, food, golf courses and the child care. especially our son was very happy with the great infrastructure for kids and the very warm and hearty care of the babysitters. Just as a matter of interest - how did you get our name and contact details? 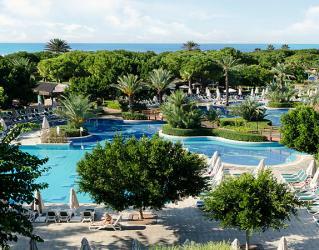 In answer to your query - we have enjoyed 2 exceptionally wonderful holidays arranged for us by Bilyana Golf. 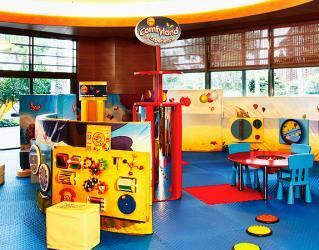 They have always been very helpful and prompt in accommodating our wishes. The transport to and from airport and golf courses has been punctual and we have definitely received the VIP treatment as promised. We never return to the same place - but made an exception this year to return to Gloria Golf organised by Bilyana. There are many resorts to choose from in Belek but in our experience the service and value for money makes Gloria one of the best. We still left wanting to return. Bilyana, I am now back at work following my very enjoyable time at the Gloria Golf Resort, I would like to pass on my thanks to you, the bilyana team for the organization that made so enjoyable. 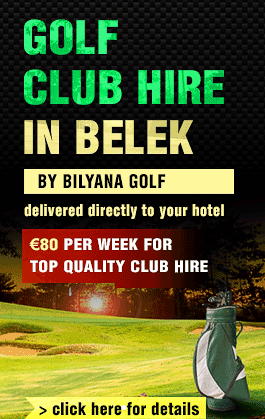 I will pass on the good name of "bilyana golf holidays my golfing friends. Firstly I would like to thank you and all of the staff at Bilyana for making the holiday that touch more special. From my first dealings with yourself to the last drop off at the airport everything was done in a very friendly and efficient manner with little fuss.the Hotel was wonderful, and we received a number of comments from fellow tourists who had heard that the Gloria Golf was the best in the area. The food, staff, rooms and facilities were 5 star. I would certainly go back at sometime in the future and will certainly use your company to arrange the holiday.